On this episode Corrie is joined by Tiwanda Pierce, a gifted artist, author, poet, inspirational speaker and transformational life coach. Tiwanda uses art as a direct link to negative energy release and peace deposits in combination with life coaching to strengthen communities, enhance the quality of relationships, built character and promote self-development. Tiwanda’s life experience that she shares on the show is that of incredible strength, after enduring the trauma of sexual assault as a teen, she attempted to commit suicide twice but luckily was not successful. During this timeframe she started to use self-harm as an outlet for her pain for many years. It wasn’t until her son introduced her to painting that Tiwanda learned that art could be an effective outline for expressing pain. When she lost him to the very same demons that tortured herself as a young adult, she was determined to make sure that other young people don’t suffer the same way that she did. Now, through Canvases and Conversations she’s helping make an impact on the mental health and wellbeing of others. Tiwanda Pierce is on a journey to see lives valued and saved one reverenced and irreplaceable life at a time. Tiwanda Pierce is a gifted Artist, Author, Poet, Inspirational Speaker and Transitional Life Coach. She uses art as a direct link to negative energy release and peace deposits in combination with life coaching to strengthen communities, enhance the quality of relationships, build character, and promote self-development. She has been recognized in Strathmore’s Who’s Who. Understanding the trauma that some girls will endure, Tiwanda became certified as a life coach in 2011 through the Professional Woman Network. She developed TEEN ESTEEM curriculum and workshops and packaged them in guided journals such as; Shine, He’s The One, That’s What I Dream Of For You, I’m a Treasure, Dating Vows, It Takes You, and Proverbs 31 Daughter. Taking lessons learned from personal experience, Tiwanda works with great pleasure to empower youth to adult both male and female to Just Live! and to do so from their greater authentic selves. On a quest to bring wellness and healing to all who may be in need, she began volunteering at The Sojourner House where she first introduced and led her twelve week Mourning to Mastering Life Program for the ladies there, dealing with drug and alcohol abuse, separation, death and loss. To date, Tiwanda has spoken to groups of teenagers such as those at the Manchester Craftmen’s Guild who are dealing with the issue of depression and other mental health matters and at Bloomsburg University where she addressed the audience on trauma and mental health matters. She also presented at Glory Scars Ministry were she spoke to a group of adults dealing with loss. Having experienced many things in her personal life’s journey, as noted in her memoir, He Held Me Close: Reflections Of A Life Almost Lost, through different storms including battles with depression and two suicide attempts, to her most heartbreaking ordeal, losing her younger son Anthony to suicide, Tiwanda has joined the movement to stand with those exposing mental health matters, in the fight to prevent suicide and walk alongside those struggling with depression. She is able to reach people on a deeply personal level and inspire them to value themselves and stand in their purpose. As the owner of Canvases and Conversation, LLC she is continuing the charge her son gave her before passing, to keep creating when he reminded her several times that he put his paint and canvases in her studio. And in his honor, she co-founded Anthony’s Art Foundation in an effort to give the gift of art to urban youth and organizations serving children who may need art exposure and supplies or uplifting through self-esteem conversations and mental health awareness. 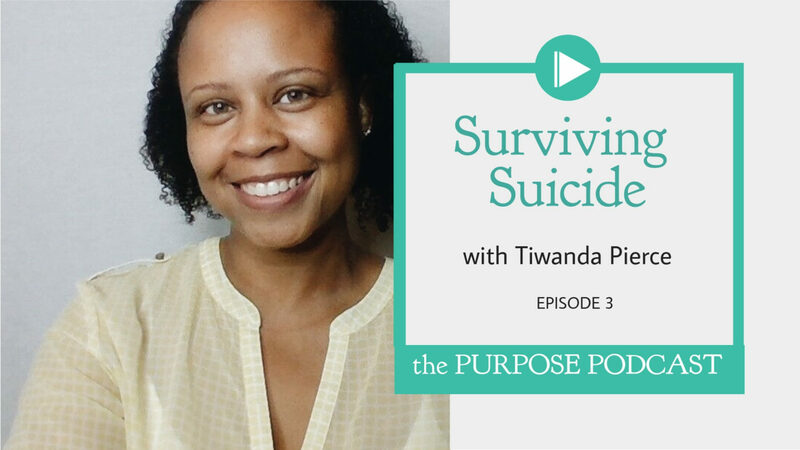 This entry was posted in The Purpose Podcast and tagged creativity, painting, suicide loss, suicide loss survivor, suicide survivor, Tiwanda Pierce.